"Redefining District ROI: New Metrics for a Better ROI"
Throughout the nation, superintendents of K-12 public school districts face unprecedented challenges in guiding their schools through a perfect storm of social upheaval, revolutionary technology, changing educational policy, and decreased public funding. It’s now high time for K-12 schools to look beyond the financials when it comes to investing in data management systems. How can measuring non-fiscal returns reveal a clearer value of the investment? 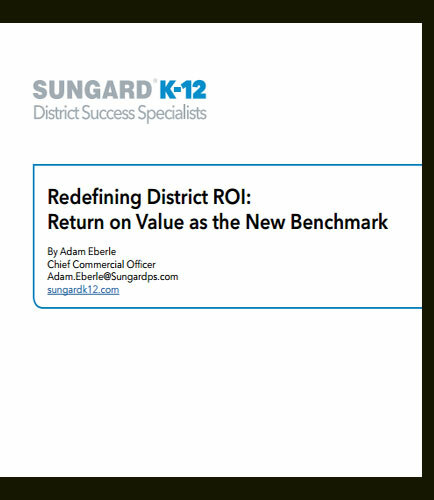 This whitepaper helps in redefining the traditional business concept of a return on investment (ROI) is required to recognize community-wide district benefits. This benchmark will turn your district into a K-12 Success Ecosystem. What is Facility Management ? A facility is something that is built or established to serve a particular purpose. All businesses use a variety of facilities depending on their fields. Facility management or FM is an integral part of every business where an effective approach has to be adopted by the business to manage the demand, supply, workforce, inventory, space allocation, maintenance and so on.